5793 labyrinths found. Showing 201-220. Sorted by country, state, city, then zip/postal code. The labyrinth in the rain. 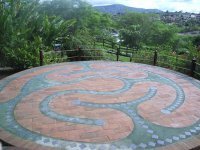 Seven Circuits Healing Labyrinth - "Labirinto de Cura de 7 Circuitos"
Visits on Saturdays from 16:00 to 17:00. Easily reachable from Sao Paulo (200km). Everybody's always adding a stone. 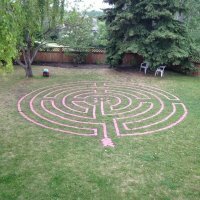 Labyrinth painted on November 15, 2015. From Wednesday until Saturday from 14.00 to 20.00, but must be scheduled in advance. 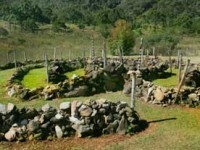 The Green Labyrinth is in the Praça das Flores (Republic Square) and is located in the center of Nova Petrópolis, a typical German city of Serra Gaucha. Formerly a small soccer field, in the late 1980s residents suggested the space was turned into a tourist attraction, to benefit the city. Mr. Hans Hesse, a German resident of Nova Petrópolis suggested building the Labirinto Verde, which was then opened in 1989. Easy access for free, with parking and public restrooms on site. 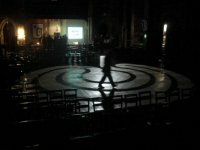 Contemporary labyrinth of three interconnecting circles (representing the physical, emotional and spiritual bodies) forming a single, continuous path. Please call or write for detailed driving instructions. 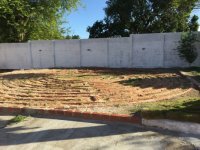 The labyrinth is open to those who are not participating in the retreat only just before the sunset prayer session. Please get in touch by phone or email so we can schedule your visit. 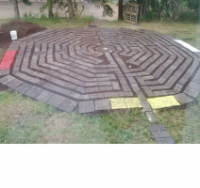 Outdoor labyrinth made from recycled materials, located to the west of the historic Athabasca United Church. Turn south at Silver Springs Gate exit off Crowchild Trail. Right on Silver Springs Boulevard, take first right - Silver Springs Drive. Go about one block and take gravel road to baseball diamond parking lot. On foot, follow wood chip pathway north 200 yards to Labyrinth on your left. It is open when the church is open, but call to make sure it is not in use for other activities. Double square classical 7 circuit - infinity labyrinth. It has a left and right facing labyrinth positioned opposite each other, so you can move from one directly in to the other. There is a square cross each centre with a circle in the centre of each cross. 25 feet each for a total of 50 x 25 feet. Light Labyrinth available for public use Wednesdays from 12 - 2 pm in the Sacred Space / Chapel. Weekly on Wednesdays from 12 noon until 2 PM. Labyrinth is in the back yard of the adjacent house. Free parking in adjacent north lot. Open to public subject to occasional events booked in the garden.